The following two reviews appear to be reasonably informed reviews on DMs classic Music of the Crusades. They emanate from Amazon. Of the "Music of the Crusades" collected on this very interesting album, several actually deal with the Crusades. I am always on the look out for interesting bits of music and film that can be used in history classes to bring the period alive for students and this certainly qualifies. This album contains examples of different types of songs, sung mostly in French and Latin. The lyrics alone are fascinating ("The French are degenerate if they refuse to support God, for I have warned them") and one song, "Ja nus hons pris," is attributed to Richard the Lion-Heart. Teachers covering the Middle Ages can certainly find a song or two to share with their students that will give them a sense of the times. The liner notes by James Tyler explain that of the sixty-odd manuscripts surviving of troubadour and trouvere poetry, only a small number contain musical notion. Similar to the notation of Gregorian chant, these early notations give the performer a series of pitches to be sung without any indication of specific rhythmic values. Consequently, modern musical theories are used to develop these songs, taking into account the instruments of the period (lute, bells, harp, tabor, etc.) that we know existed from contemporary pictorial and literary evidence. So, I have to think that music students will find this album of interest as well. Performed by the Early Music Consort of London, I can certainly appreciate the effort made to achieve authenticity. Of course, we can never know how accurate these recreations are, but I certainly do not consider that a problem. I have been listening to several similar albums of music from this period, and this is the best I have heard so far. The time of the Crusades spanned several centuries, from the time Pope Urban II called upon Christendom to fight for Jerusalem until the thirteenth century (this does not include the numerous minor, unnumbered crusades, sometimes against other Christians). The Crusades became for many in the Middle Ages a romantic ideal; the appeal for those who would join the Crusades was two-fold, both riches in this world and salvation in the next. In this collection, the texts of the songs are primarily contemporary with the Crusades, although a few come from later troubadour and folk songs. Some songs here directly relate to the Crusades in content (for example, Pax in nomine Domini! ), whereas others are songs contemporary with and popular among the Crusaders, but have no direct relation to the Crusades. 'Ja nus hons pris' is one such song, which has origins attributed to one of the most famous of the Crusaders, Richard the Lionhearted. One of the problems with music from this time period is that very little written material exists. What music notation there is often is reminiscent of Gregorian chant - there are markers for pitch, but nothing for rhythmic values, melodies, etc. Similarly, the types of instruments are often not listed for particular songs, so it becomes educated guesswork as to the instruments used - lutes, rebec, wind instruments, percussion, etc. The performances here are wonderful and full. 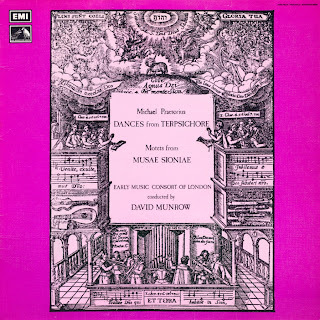 The Early Music Consort of London recorded this first for vinyl in 1970; this CD is a reissue, well engineered. David Munrow was the director as well as performer on recorder, fluet, shawm, crumhorn and bagpipes. Munrow's talents are well suited to this kind of medieval music. Among the other performers are soprano Christina Clarke, counter tenors James Bowman and Charles Brett, tenor Nigel Rogers and baritone Geoffrey Shaw. Musicians include Eleanor Sloan on treble rebec, Oliver Brookes on bass rebec, James Tyler on lute and citole, Gillian Reid on the bells, Christopher Hogwood on harp, organ, nakers and tabor, and James Blades on nakers and tabor. This recording is superb, a great addition to an early music library, and a joy to have as a CD - I had the vinyl of this, but over time it warped in storage, and I was very sad to have lost such a brilliant collection of music. Here it is again, restored and full of power and life.